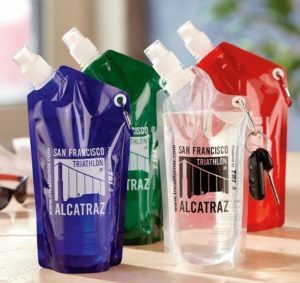 This custom printed collapsible water bottle with carabiner clip conveniently folds up for flat storage when empty. Flatten it, fold it, fill it! This 28 oz. Collapsible Water Bottle is BPA-free and includes a push-pull white cap with removable cover and a metal carabiner clip. This reusable canteen is great for the environment, lightweight and reusable. Measurements are 9-3/4″ high x 5-1/2″ diameter flat, or 9-3/4″ high x 4-1/4″ diameter filled. Collapsible Water Bottles are great for outdoor events.